Offer is available only for customers registered in UK. Min. £10 deposit. Select 'WELCOME BONUS' option when making first deposit. To activate AccA Bonus Bet click 'PICK BONUS' on betslip, followed by 'ACTIVATE' and confirm. AccA Multiplier Bonus bet must contain 3 events with min. odds 1/4 (1.25) per selection and total odds of 3/2 (2.50). Here is the extended list of the Energy Bet offers. How to register with the EnergyBet.com? The whole process of joining EnergyBet.com takes only a couple of minutes and is completely free. Naturally, you have to open the website of the sportsbook first. The next step would be to click on the big yellow “Register” button that is located in the top left corner of the screen. EnergyBet.com will ask you to fill in some standard information and pick username and password. Enter the label MAXEC as your promo code before validating the page. Once you’re done with the two forms, you will have to confirm your email address. Simply go there and you will find an email sent by EnergyBet.com. It will contain a verification link. Click on it and the procedure will be complete. EnergyBet.com is giving each new player the chance to get a 100% first deposit bonus of up to €25. To claim the welcome offer, you have to register and verify your email first. When you’re done with that, make sure to select the bonus and complete your first deposit. EnergyBet.com will match it up to €25. 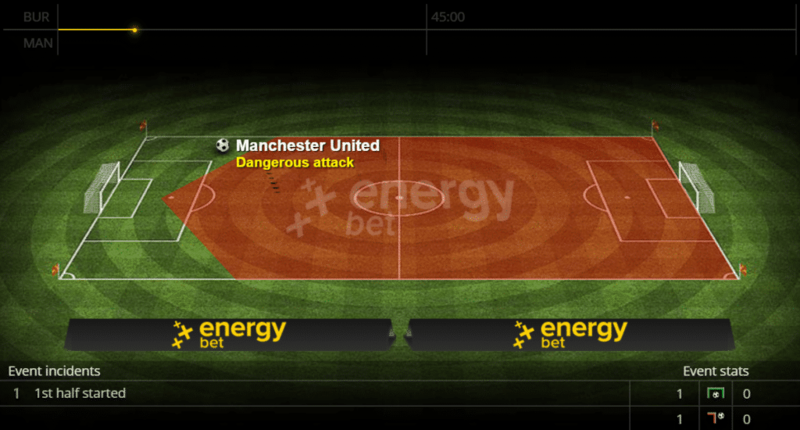 EnergyBet.com obviously values loyalty, as the bookmaker has created the Energy Shop. Each time you place a real money wager, you will collect Energy Points. You need to play with €5 to earn 1 point. You can use those Energy Points in the Energy Shop later on. One of the options is to directly exchange them for cash at a rate of 100 Energy Points for €1. You could also buy various other rewards. Watch out for some of the EnergyBet.com special deals that could bring you large bonuses or allow you to exchange your points at a much better rate. 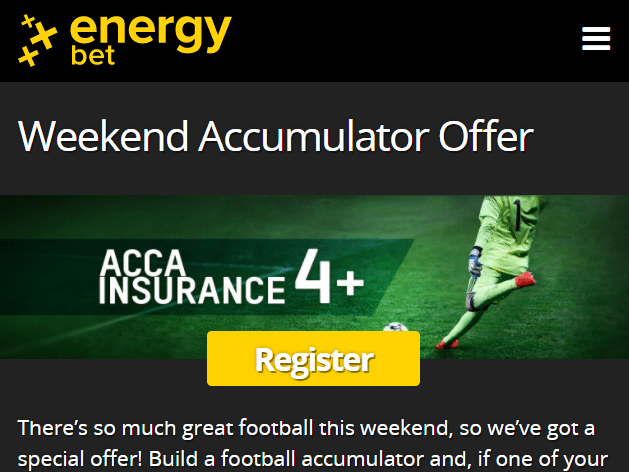 People who like multiple bets will be delighted to see the Acca Insurance promotion by EnergyBet.com. If you place an accumulator with at least 4 football selections and only one of them fails, you will get a refund of up to €10. The promotion is active during the weekends only, but all matches offered by EnergyBet.com are included. It’s interesting that EnergyBet.com has an invitation-only VIP club that offers all kinds of benefits. However, getting in there is not an easy task. You will have to be a true high-roller and place large bets on a regular basis. Still, if you are among the few chose ones, you will get some exclusive promotions, as well as a personal VIP manager. While EnergyBet.com doesn’t have any other ongoing promotions, the company often launches limited-time specials that could bring even more extra value to the table. The best way to stay in touch with what’s up for grabs would be to check your email and the Promotions section of the EnergyBet.com website on a regular basis. No additional offer will be awarded if the MAXEC promo code is entered. We are used to a certain layout that most bookmakers out there use, but EnergyBet.com proves that things could be simplified and still work well. For a start, the whole design of the platform is impressive. Black is the dominant color and everything looks beautiful and stylish. It’s not only about looks, though, as the whole platform is designed in a way that allows easy access to the betting coupon and the other features. Simply pick Sports from the top navigation menu of EnergyBet.com and you will see a grid of all sports covered by the bookie. Going to the live console is also seamless, as you can simply click on Live Betting. The same logic applies to the promotions page. Each of the sections is well-organized and easy to use. Finally, EnergyBet.com made sure to add plenty of useful links for quick access to the home page. Handball: you might be surprised to see us paying special attention to handball, but EnergyBet.com is proud to be one of the best bookmakers online when it comes to this particular sport. As already mentioned, the number of sports covered by the bookie is over 30, so you will be able to find plenty of options. A lot of them are part of both the pre-game and in-play betting coupons of EnergyBet.com. It’s interesting that the sportsbook offers plenty of options to bet on e-sports, such as League of Legends, DOTA 2, StarCraft 2, and Counter-Strike: GO. When it comes to the odds offered EnergyBet.com, we were quite impressed. The betting margin offered is way better than the industry average. This means you will find some good value here. Other options: the sportsbook made sure to add various other methods and their availability depends on your country. If the options we mentioned so far doesn’t suit you, we recommend you to see what local options are covered by EnergyBet.com. All these options are compatible with the official bonus code: MAXEC. EnergyBet.com made sure to provide each customer an easy way to contact the support. Simply click on the Help button in the top left corner of the website. This will display all the available options. The fastest way to talk to a representative of EnergyBet.com is to pick the live chat. You could also call the staff or use the web form to send a message. The overall impression is that the customer support team is fast and polite. As every modern operator out there, EnergyBet.com is aware that having a smooth mobile version is crucial nowadays. Most old-school bookies rely on native apps mostly, but that’s not the case with EnergyBet.com. The company took full advantage of the rapid rise of HTML 5 and the opportunities provided by the latest phone and tablets on the market. As a result, EnergyBet.com has built an exceptional mobile-responsive website that will easily adjust to iPhone, iPad, Android, Windows Phone, or any other modern phone or tablet. No app has been released so far. As soon as you open the page on your device, it will find the best settings. There are no awkward graphics or long loading teams. Everything looks good and runs smoothly. The design and user interface of EnergyBet.com provide a seamless experience on the go. Just a couple of taps will open any betting market or feature you want to reach. The best thing about the mobile version of EnergyBet.com is that it provides full access to all sports and markets covered by the bookie. You can also clear bonuses, bet on live events, and earn Energy Points. EnergyBet.com was launched in 2016 which makes it one of the newest bookmakers online. This shouldn’t fool you, though, as the operator has been offering other gambling products since 2012 and has plenty of experience. The sports betting platform of EnergyBet.com was developed by BetConstruct and has a modern look and feel. If you are interested in the services and promotions of the bookie, our review below will provide a lot of useful information. You would expect issues from any bookmaker that has been on the market for only a year or so. However, that’s not the case with EnergyBet.com. The sportsbook is more than capable of holding its own even against some of the best operators on the market. The loyalty program and the welcome offer provide enough options to get some extra value. However, where EnergyBet.com really shines are the high odds and solid number of markets covered. Each player can easily find a suitable game and a good price. On top of that, the bookmaker has a fascinating website that works on all platforms, include mobile devices. Rumors are, EnergyBet.com will add live streaming and other cool features in the near future which will make the bookie even better. 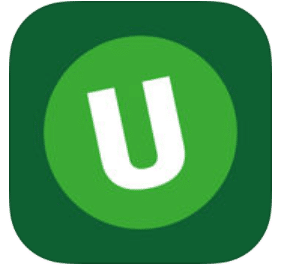 Unibet has all the advantages of a traditional bookmaker: a lot of betting options, good odds, high limits, and various cool features. At the same time, the sportsbook is trying to always add something new and improve its service. This is why we believe Unibet is one of the best in the business. Check out our bonus code to get the £50 welcome offer. You simply can’t overlook Bet365 when it comes to online betting. The bookie is arguably among the best out there for multiple reasons. 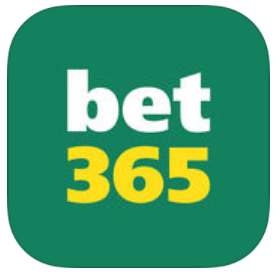 Some of the best prices in the industry, an exceptional live console, tons of promotions, and a smooth mobile version are just some of the things that make Bet365 so good. Coral is an old-school bookmaker that started with some brick-and-mortar betting shops across the United Kingdom. The company has been around for ages and managed to stay relevant by joining the online revolution. Nowadays, the website of Coral offers a ton of different markets and one of the best promotions & free bets schedules out there. You can always get some extra value with the deals of Coral.